Having written about wine professionally for almost two decades I have visited thousands of estates in dozens of countries, covering every wine-making continent. From tiny, ‘mom and pop’ operations to industrial giants, and from hugely traditional cellars to gleaming high-tech temples, it is easy to think I’ve seen it all. Sometimes though, a wine estate can really surprise me. 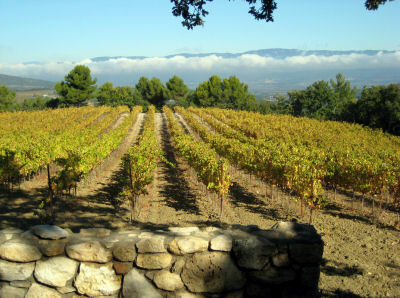 A case in point is my recent visit to the estate of Château La Coste in Provence. Twenty minutes north of Aix-en-Provence, Château La Coste’s long driveway through vines, olive groves and oak trees reveals nothing of what’s to come. As you near the winery buildings the first thing that strikes you is the enormous new facility, a super-modern building in glass, concrete and steel with shimmering refelctive pools and bold, contemporary works of art dotted around it. Just beyond, the original 1682 villa and farm buildings offer a profound contrast, the soft pink stone glowing in the wintery sunshine. 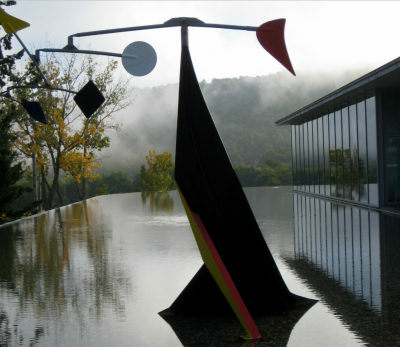 Right: Alexander Calder’s “Small Crinkley” outside Tadao Ando’s visitor centre (click for large version). A petite woman bustles towards me with outstretched hand. She introduces herself, speaking so softly that I struggle to catch her name but not her lilting Northern Irish brogue. 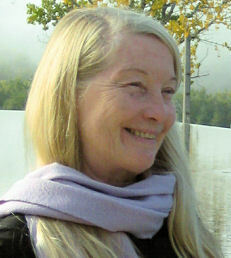 This is Mara McKillen, sister of the estate’s owner, Irish property developer Paddy McKillen. Mara is managing the extraordinary art and architecture project that is being created here, and bubbles with enthusiasm for it. Though instrumental in her brother being in France (she came here decades ago, “to follow a dream,” she says mysteriously), she refuses to discuss how much money is being invested in the creation of La Coste. Normally described as ‘the reclusive Mr McKillen’ in newspaper articles, he is a controversial figure in light of the Irish financial crisis. His business portfolio spans the globe, including co-ownership of the Connaught, Claridges and Berkeley hotels in London. The wine-making side of this estate has not been ignored since Paddy McKillen purchased it a decade ago. 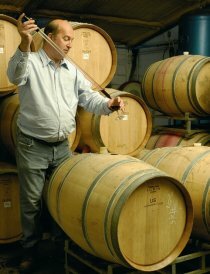 It has converted to biodynamic farming, a new winemaking team was brought in and, in 2008 a brand new, gravity-flow winery was built, designed by prominent French architect Jean Nouvel. Winemaker Matthieu Cosse is making some really excellent wines that will be included in my forthcoming feature on the wines of Provence. But it is McKillen’s long-standing passion for art and architecture that makes La Coste so extraordinary. His vision for involving art and architecture in Château La Coste has been forming over the past few years and the scale and quality of what he has already achieved, and what is in the pipeline, is simply breathtaking. McKillen has set about transforming the already beautiful, 250-hectare estate to house an art, sculpture and architecture park of global scale and quality. Many upmarket wine estates have art galleries and collections, but not like this. McKillen has engaged the world’s top architects and has commissioned buildings from them, dotted around the estate. Tadao Ando, Ai WeiWei, Jean Nouvel, Frank Gehry, Sir Norman Foster, Renzo Piano and Oscar Niemeyer are just some of the names who either have buildings there already, or which are in construction. 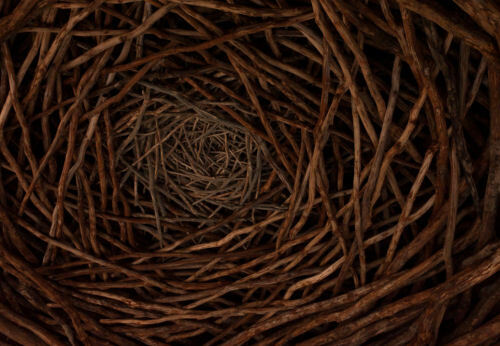 Artists of world renown including Richard Serra, Andy Goldsworthy, Hirosho Sugimoto, Louise Bourgeois and Paul Matisse have been invited to stay on the estate, wander its miles of paths, vineyard and woodland, and create specific piece for it. These are mostly monumental in scale, and are intergrated into the landscape, built into hillsides, nestled underground, erected on top of hills and enclosed in woodland clearings. So far six buildings are completed and 22 sculptures/installations, but there are many more under construction involving bridges, tunnels and reforming of the landscape. A 29-room hotel is also being built, designed by Tangram and each room with its own private garden and swimming pool. The estate has only just opened its grounds to visitors. A fee of nine euros gains access to a self-guided walk taking in all of the buildings and installations, the mapped out paths taking around two- to three-hours to complete. The finishing point is the visitor centre, with its art book shop, café selling food made with local produce and the option of tasting the estate’s wines. Though I spent a few hours in Château La Coste, it is already earmarked for a return visit in 2012 to allow more time to take in the scale, breadth and extraordinary ambition of this project. Each artist is invited to choose their own space on the 250-hectare estate, and design a work that will ‘live there’ amongst the landscape. 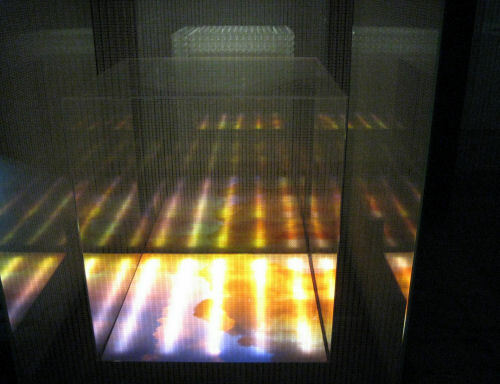 Below is DROP, by Tom Shannon, 2009. New York born artist Shannon has created this kinetic sculpture based on dew-drops. It is sited on a little clover meadow, covered in dew drops, reflecting the vineyards and from another angle, the Frank Ghery pavilion. Click on it to play a short video. One of the most powerful pieces in the collection is British artist Andy Goldsworthy’s Stone on Wood (2009). Goldsworthy found a lovely old stone wall and constructed an enormous, grassed bank behind it. He then broke a small doorway through the wall and down into an underground cavern. With no natural light and a clay floor the room as pitch black at first, cold and eerily quiet. As your eyes adjust you realise you are inside an enormous ‘web’ of woven oak trees. 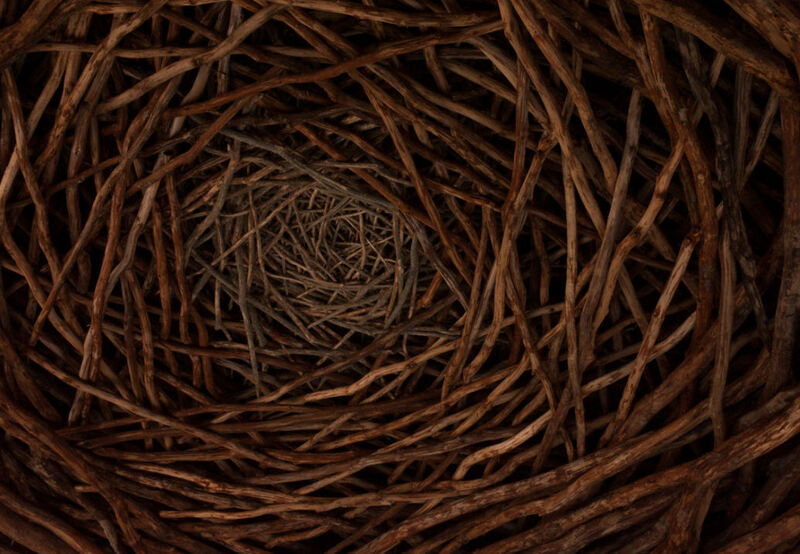 Hand-built by Goldsworthy and his team, it is both unsettling and profoundly beautiful. This piece by Japanese artist and architect Tadao Ando is called ‘Four Cubes to Contemplate Our Environment’ (2008), and was already in Paddy McKillen’s collection before this project began. Ando was also commissioned to build a pavilion specifically to house the work which explores sustainability and the environment. Having first glimpsed them through slits in wooden wall, visitors can walk down and amongst the cubes. 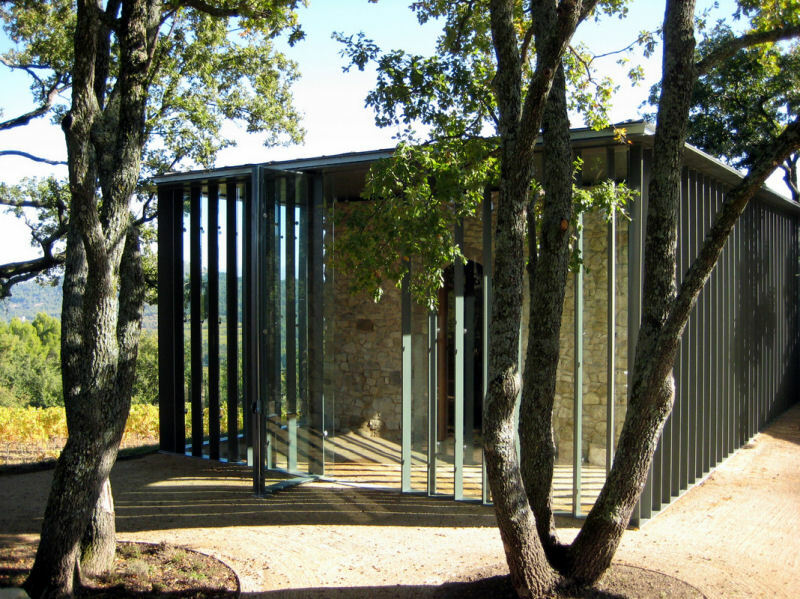 When Tadao Ando saw this ruined chapel on the top of a hill, set in a small grove of trees amongst the vineyards, he said he “wanted to wrap his arms around it to protect it,” and the resulting work is a glass cube that surrounds the ruin. There is no ceiling to the chapel, so when the door is closed it is dark apart from light that floods in from the gap to to the pavilion roof, and through three small holes that illuminate a glass altar. 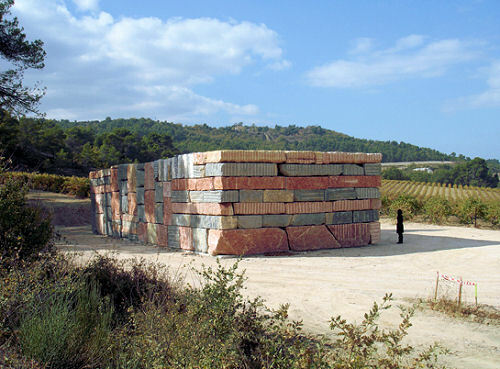 Sean Scully’s Wall of Light Cubed (2007) is a massive, solid work by this Irish sculptor. 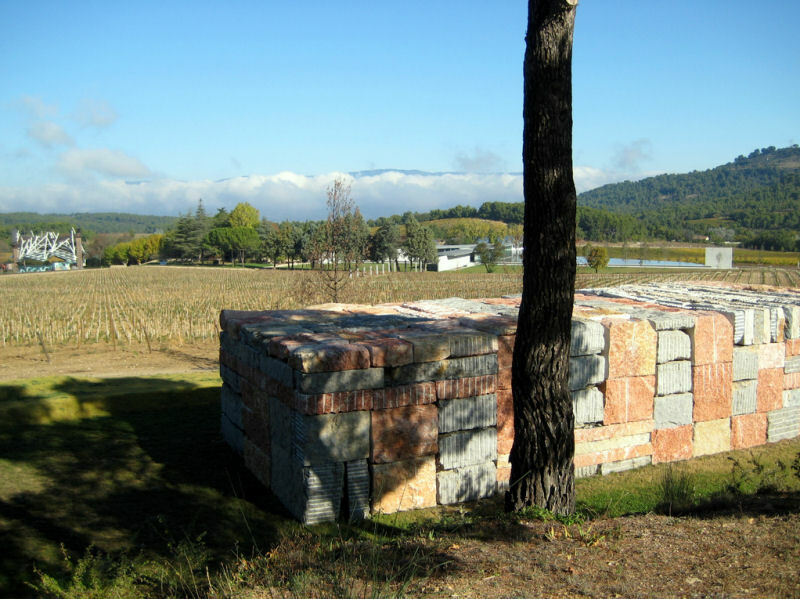 Made from enormous blocks of stone cut from various quarries, it sits beneath some ancient oak trees looking over the vineyards to the Ghery pavilion. Picture courtesy Kerlin Gallery Ireland. 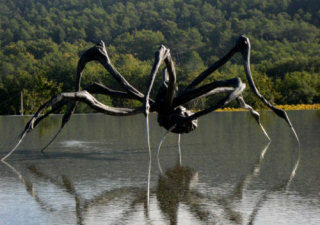 One of the last works completed by Paris-born artist Louise Bourgeois, this dates from 2003 and was installed at Château La Coste just a few days before she passed away in New York, aged 99. 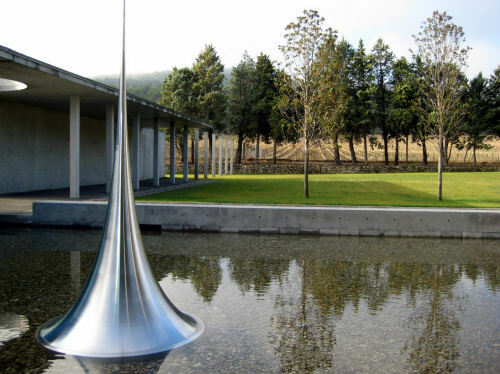 It sits in a pebble-filled reflecting pool outside Tadao Ando’s visitor centre. Canadian architect Frank Ghery already has wine connections, including his famous hotel designed for Marquis de Riscal in Rioja. This Pavilion will host concerts and was built in 2008. Photographer and artist Hiroshi Sugimoto’s Infinity, from 2010, is such a simple piece, its hard, shining surface elegant and alien in the pool of water with vineyards and forest beyond. French architect Jean Nouvel’s cellar appears as two simple, metal-clad half-cylinders, here seen against the original 17th century bastide. 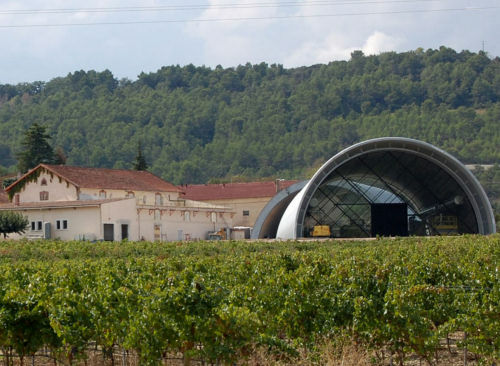 In fact the two parts of the cellar, for reception and ageing, extend for three floors underground and are connected by tunnels, with every aspect of the grape and must-handling operation managed by gravity flow. These are just a few of the scores of installations and artworks on the estate. With so many more planned, Paddy McKillen is building an incredible legacy that for any wine, art or architecture lover is unmissable. A PDF map of the Art & Architecture walk is here.